Double cooked, BBQ flavoured pork crackling served in a 1.5ltr jar. The perfect gift for a meaty treat aficionado. Our 1.5 ltr/275g gift jars are high quality plastic, reusable items, but if we're honest they're a mere side show to the epic porky goodness inside. If you love the wonderful, smokey taste of BBQ than this one is for you. If you're not a fan of it, then you might want to steer clear (or at least buy it for a mate). You can keep the piggin' dream alive by adding a specially priced refill bag to your order- They're designed to restore your jar back to its filled-to-the-brim glory. We offer a range of flavours, please see our other products. There's something for pretty much everyone, except maybe vegetarians. Our jars carry a typical 14-16 week best before date, though the crackling will last somewhat longer if kept air tight. It simply softens a little over time. 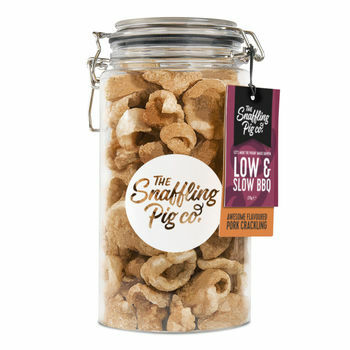 Hand cooked, high quality pork crackling. The Nutritionist Pig says these bad boys are gluten free. Pork Rinds, Salt, Flavour Enhancer: E621, E635, Spice (Paprika, Cumin, Coriander, Cayenne), Tomato Powder, Acidity Regulator E262, Dextrose, Hydrolysed Vegetable Protein, Dehydrated Onion, Garlic Powder, Natural Flavouring, Paprika Extract, Spice Extract. This product is dispatched to you by The Snaffling Pig Co.